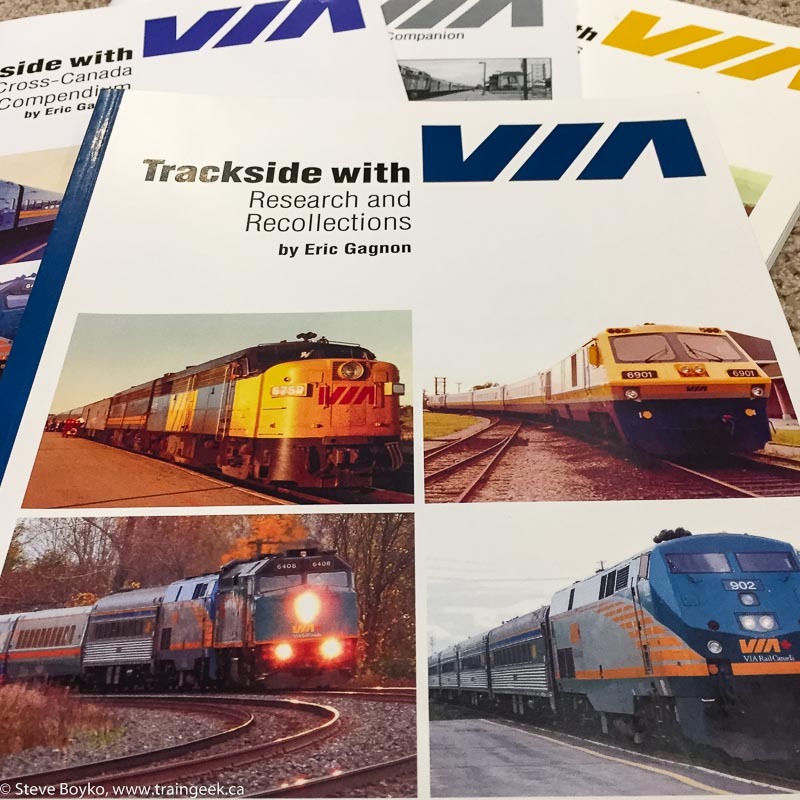 As soon as I could, I ordered Eric Gagnon's fourth VIA Rail book, "Trackside with VIA: Research and Recollections". Eric had been writing about his upcoming book for a while at his book blog, and my anticipation was growing and growing. Eric is a good salesman! Pssst... Read to the bottom for a giveaway! I placed my order and paid via e-transfer (his first!) and in a few days the book arrived in the mail. As requested Eric had signed the interior, and to my surprise it was numbered Copy #001. Research and Recollections is a soft-cover perfect bound book with 124 pages plus the title page and table of contents page. The book contains a lot of text, as well as numerous small photos (mostly black and white) and a number of tables. This is not a coffee-table picture book, but it is very accessible and easy to read. After several introductory pages (including a foreword by Tim Hayman and a dedication to the author's father) the book launches into a series of trip reports. These really set the tone for the book and draw the reader into the world of VIA Rail in the 1980s. Eric is a meticulous record keeper and it shows in his stories. The level of detail - what he ate, what he paid for it, for example - is impressive, yet it doesn't detract from the stories. In fact, I would say the details add to the stories and really place you in the moment. 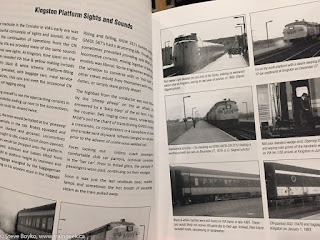 These stories take up about 40% of the book, and include black and white photos related to the stories, as well as several "triVIA" boxes featuring.. well, trivia about VIA Rail. After the stories are numerous research articles, from vice-regal cars to sleeper car swaps in Winnipeg to the IC3 Flexliner trial, and much more. Maybe the book title should really be Recollections and Research to be in the proper order! These articles are very engaging and each could easily be expanded into a quality magazine article. After the guest contributions follows what is, in my opinion, the weakest part of the book. There are 26 pages of consist information, a full 20% of the book. I know Eric loves consists, and so do many other railfans, but for me that was 26 pages of fast forwarding. Maybe that's why I read the book so fast the first time! This section is followed by 10 pages of colour photos, six per page. Many are Eric's but other photographers are also represented. Full advantage is taken of the colour to show VIA's many wraps, from Home Hardware VIA 6429 to the Grey Cup train to today's Canada 150 wraps. A huge variety of VIA equipment is shown, including F units, RDCs, the blue and yellow fleet, Renaissance... VIA certainly has had quite a variety! The final few pages of the book include some reference material and tables to finish it off. I think by now you can tell that I really like Research and Recollections. 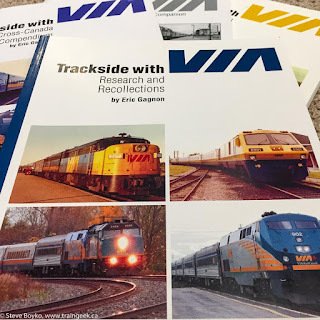 The stories at the front really give a good flavour for what travelling on VIA Rail was like in the 1980s, and the many research pieces and photos - especially the colour ones - provide a great deal of deep information on many aspects of VIA past and present. I'm not interested in the consist tables, but I'm sure many people are. Even if those pages were completely blank, I'd still recommend this book! It's affordably priced at $35 for Canadians, shipped, and $40 shipped to the US (prices in Canadian dollars); contact Eric for international shipping costs. You can download and print the order form, or Canadians can send Eric an Interac e-transfer to his email address, listed at top right of this site. If you are a Canadian railfan, you need to buy this book. Everyone on my mailing list by the end of Monday, May 8, 2017, Central time will be eligible. If you're not on my list yet, you have a few days to join! I will randomly choose one person from my mailing list and email them to get address information. If for some reason I'm not able to contact the winner, I'll draw again. If the winner is outside Canada or the US, we'll talk. Join my list if you're not already on for a chance to win! This review was written on WestJet flight WS 202 from Calgary to Winnipeg. I was not asked to review this book and I have no financial incentive to promote it.